Shopping from Highland Farm is best way to live healthy. You can find fresh ideas for your next meeting or party. Order your favourite plate and just relax. Their professionals will make most delicious party tray for you. Breakfast bites, appetizers, deli cheese and vegetables, party platters, fabulous fruits, divine desserts and more. You can order your food by filling form or call to market. Special order cakes would be good choice if you will celebrate a b-day here would be amazing choice for special days. If you ask me, party platters are delicious. Up to 12 persons you can find special trays as well. Let’s check currect Highland Farms Flyer ! 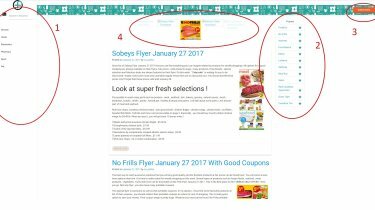 Here is one of the best stores in Canada that you can find the freshest and high quality products with fair prices and unique deals every week. You can find most your needs related to basic kitchen foods easily. Highland Farms always works top brands so you will get always great quality products in their stores. 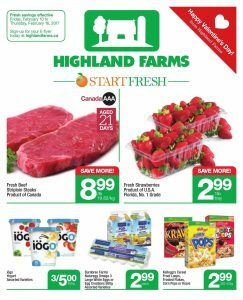 A lot of parts such as produce , bakery , dairy , popular , everyday essentials , seafood , frozen , deli , meat are available on Highland Farms Flyer April 27 2017. Some helpful advices about offers of them have been selected for you on this article. Enjoy cheap and quality shopping thanks to them. If you want to pay less for the best weekly shopping , be sure that you are correct address now ! I want to start part of produce. You will come across super fresh and good looking fruit and vegetables when you check on page 1. Their prices is quite reasonable. Especially , organic selections are drawing attention. You should focus them. Red seedless grapes , $1.99 lb. Ontario homegrown greenhouse sweet bell peppers , $1.99 lb. Packham pears , $1.49 lb. Seedless orri clementines , $1.49 lb. Premium bananas , $0.99 lb. Page 3 was created from your favorite and popular products. Various types of products such as snacks , drinks , cereal , coffee , desserts and more can be found at cheaper prices. When you buy more some of them on this page , you will save more. Let’s check and get your needs ! Let’s enjoy discovering extraordinary and new tastes recipe with Highland Farms Flyer February 12 2017. Desserts, international dishes, meats, pastas, poultry, seafood and more waiting for you. You will be surprise about plenty choice. More than two hundred recipes on now. They don’t offer only food. They provide fresh ideas too. You should browse special dinner varieties. Also in freezer you can find frozen entrees or bread and artisan bread at bakery rayon. Freshly made and ready to be service baked goods would be good choice if you don’t have time to prepare something. Just visit and buy your favourite at reasonable prices. In addition , they introduce you good looking specials for Valentine’s Day on part of bakery. If you are looking for some goodies such as cakes , bagels or brownies , you should check on page 2 of this fabulous flyer. Especially , Dufflet pastries fresh 6″ strawberry mousse heart cake will draw your attention. It’s only $13.99 ea. Baker street fresh 8 inch red velvet cheesecake , $21.99 ea. Part of produce is also awesome. If you are in search for super fresh and vibrant fruit or vegetables , you will find whatever you want on page 1. Honeydew melons , peppers , kiwi , tomatoes , romaine hearts , mangos , zucchini , celery , avocados and more can be found at fair prices. 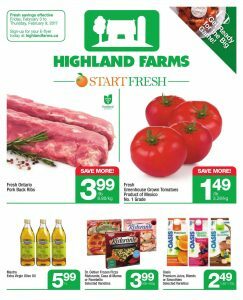 Highland Farms Flyer February 5 2017 welcomes you with Fresh Savings. 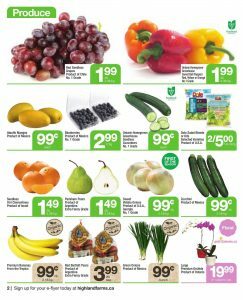 In today’s flyer, many fresh and healthy food such as meats, groceries, vegetables and fruits on big discount. In Highland Farms, you can find the best fruits, meats or vegetables for your kids and family. It will serve you the freshest and organic foods with best prices. There is also an event called “Fresh savings effective” until Funerary 9, so check out this brand new flyer for biggest savings. Now lets check out the best deals on this brand new flyer. Today on Highland Farms, many products on various categories on discount such as Fresh Ontario Pork Back Ribs, Oasis Premium Juice, Clementines and Cucumbers. We sure selected the best products on today’s flyer just for you, but if you need anything else, then feel free to check out this brand new flyer right now ! Just click on the right hand side image to see the whole flyer. Now, lets see the best deals on this beautiful flyer. 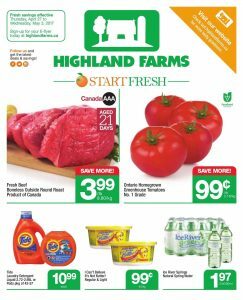 We came to an end to our list, but deals on Highland Farms will continue ! So do not forget to check out this brand new flyer for biggest deals and freshest products. Please subscribe our news teller for newest flyers, amazing discounts and countless retailers !